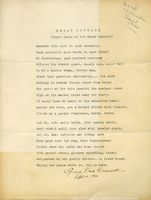 After a stay at Berry, Grace Crowell writes a poem about Emily Cottage. 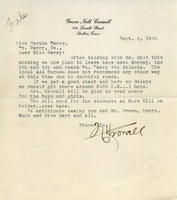 Martha acknowledges Mrs Crowell's letter about her family's upcoming visit to Berry, discusses the best date to arrive and some arrival arrangements . 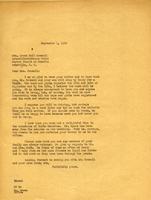 Martha also mentions Mrs Crowell's current trip to North Carolina. 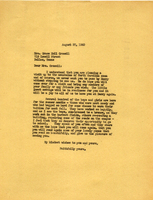 Grace Crowell would like to make a trip to Georgia to visit Martha Berry and others who work at the school. 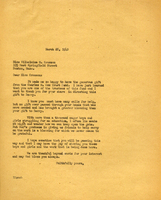 Martha Berry is writing Lucille Crowe, replying to her letter. 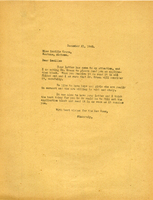 Martha says that she will be sending an application to the schools for Lucille to fill out. 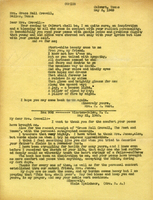 A thank you letter to Miss Elizabeth for the gifts she and Mrs. White left during their visit to Berry while Martha was away. 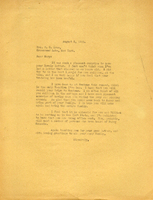 A letter from the Berry Schools (presumably Inez Henry, though unsigned) to a trustee of the Charles M. Cox Trust for their gift to the schools. 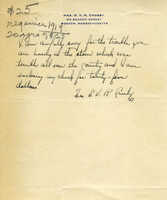 Mrs. Crosby says she is sorry about the storm that caused damage all over the country and is sending a check for $25. Miss Crosby donates to the school's Theatre Arts program. The commencement has just ended and the seniors have left. An early version of the work-study program is "well underway" and the students are grateful for the opportunity. 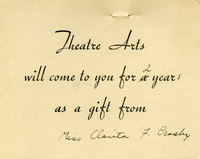 Theatre Arts will come to the recipient for 2 years as a gift from Miss Clarita F. Crosby.